DSTeck is celebrating 10 years anniversary, and as we pass this milestone it feels great how far we reached. Ten years ago we started in a small residential apartment that was almost empty! Initially, we started with turnkey solutions and web services. At that time we had one dream; to do things right and provide the best to our customers. We always remember all the effort we put to get new projects and satisfied clients. Things were not easy then, but we made it through working closely with our clients and understanding problems as our source of success. Things are different nowadays! We are happy to have 400+ clients and our services are nestled in the web application and website development, search engine optimization (SEO), user experience (UX) design, and more. We are Celebrating our 10 Year Anniversary by Offering Great Deals to the First 10 Customers! 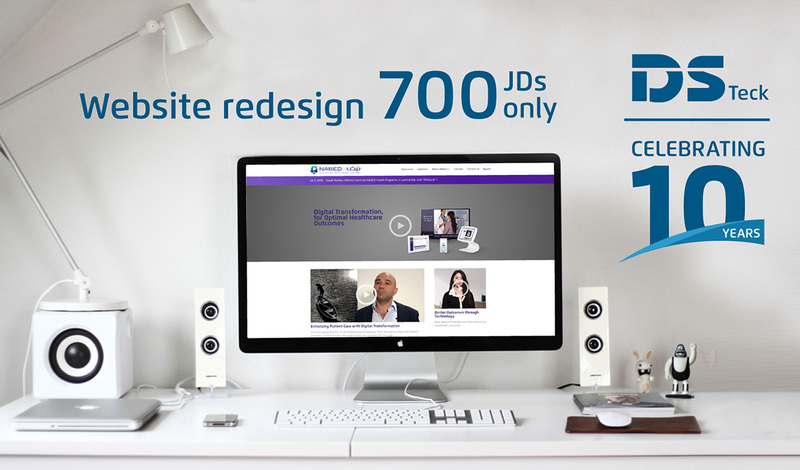 In this offer you will get your website rebuilt, and redesigned for only 700 JDs. DSTeck will be offering you a new website, and a fully rebuild for both front and back ends. Corporate websites only, E-commerce and web apps are not included. Companies with running old websites or with a fully ready company profile. Does not include hosting and data entry.